The Strategic Harmony® process extracts insights gained from customer research to inform evaluation of strategic “bang for the buck” of any portfolio of product (or service) development initiatives competing for resources. Those may be new product ideas, new features for existing products, software for smart connected products, packaging innovations, or any group of customer-impact initiatives – including customer service enhancements and IT or CTO technology projects enabling development or delivery of new products and services. Analysis includes four interrelated assessment modules that are weighted and integrated to provide higher-order metrics. 2003-2018 Strategic Harmony Partners. All rights reserved. Scorecards from these assessments are integrated and weighted based on considerations such as market share and trend, competitive intensity of your brand’s category, resource constraints, and the company’s sustainability goals. This produces a Strategic Importance Scorecard and Leverage Scorecard (how effectively each initiative’s development burden is leveraged for market impact) for each assessed portfolio, providing brand-sensitive decision intelligence for more effective resource allocation across the portfolio. 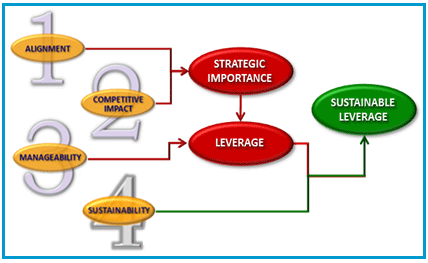 It also produces a Sustainable Leverage Scorecard that factors in early-stage assumptions about environmental and/or social impacts and how they in turn impact business benefits and risks. Importantly, each Strategic Harmony® scorecard is derived from diagnostics that explain the scores and identify specific opportunities to improve them. Typically, a client team representing multiple functions is collaboratively involved in portfolio evaluation during a surprisingly non-invasive, fast and efficient process facilitated by SHP and ultra-sensitive to your time constraints. This not only harnesses a diversity of perspectives and the deep knowledge of customers and products that our clients possess, but also provides a platform for converting that qualitative knowledge into quantitative outputs. It fosters a cross-functional shared view of the marketplace with customer voice at its center, and cross-functional buy-in of process and results. Most critically, it favors rational decision making over emotionally charged internal politics. Strategic Harmony® metrics, dashboards, scorecards, and quadrant maps provide new visibility into optimizing hundreds of product development portfolio trade-offs. These analytics form the basis for a robust set of recommendations and actions to improve return on innovation, ensure that you’re working on the right things, and identify what you can slow down or stop with minimal risk of being punished in the marketplace. Resources can then be reallocated to get to market faster with the highest-value initiatives, pre-empting competitors on the things that matter most to customers, and doing it all more sustainably. A harmonized portfolio means that products, features, and services actually brought to market become the most compelling possible proof points to strengthen brand credibility, relevance, and uniqueness – and move the customer experience closest to ideal. This releases the brand power that can only occur when what a brand promises to customers and what it actually delivers are synchronized in true harmony. Ask us about our clients’ business outcomes. We’re happy to share some cases when we talk with you.